GREENTOWN, Ind. – Much like last year’s Western Lady Panthers ending a long sectional championship dry spell, the Eastern Lady Comets ended 14 years of futility by dropping the two-time defending sectional champion Tipton Lady Blue Devils 53-44 in the championship game of the Class 2A Madison-Grant Sectional. The title was just the second in the program’s history and sends the sixth-ranked Lady Comets to the Lapel Regional to play No. 11 Winchester (20-4). The fifth year coach said even as the game was winding down and it became apparent his squad would hoist the trophy, he kept his thoughts and emotions to himself. And he never looked ahead to what would happen after the championship game. “To be honest, I didn’t even allow that movie to be played that long in my head. I just kept focusing on the clock to get to 0:00; we had to play to 0:00 on the clock,” said Dexter, whose team improved to 19-3. The fifth year coach improves his personal record to 72-34. “In fact, when it was over I consoled the Tipton players and Tipton coach Nick Comer. Then I turned to my assistant coach, Lisa Thompson, who played for some great Kokomo teams, and asked, ‘What do we do now?’ I hadn’t allowed myself to get to that point in my thoughts. The game came down to fundamentals of the Lady Comets all-time leading scorer. Tipton’s Kacie Juday closed Eastern’s lead to 46-42 with 1:26 left in the game. Tipton then started fouling the Lady Comets, and during the closing stretch Brittany Neeley drilled 7 of 8 freebies (14 of 16 for the game) to secure the sectional championship. Neeley led all scorers with 32 points and grabbed 10 rebounds for a championship game double-double. Taylor Holliday added nine and Ally Oyler scored eight. Neeley’s twin sister, Bethany, got into foul trouble and did not score a point for the first time in her remarkable career – although Dexter praised her for the defensive effort she had in the game. Tipton was led by Juday, who knocked down 24 points and grabbed a game-high 13 rebounds. Macie Lively added 13 points for the Blue Devils. 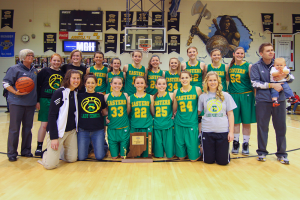 Eastern will play Winchester, champs of the Shenandoah Sectional, in the second semi-final on Saturday at noon. No. 14 Wabash (17-6) plays Seeger (19-7) in the first game at 10 a.m. The winners play at 8 p.m. Saturday night for a berth in the IHSAA Class 2A Final Four (location to be determined after the regional, but will either be the Crown Point or Warsaw Semi-State on Feb. 23). This entry was posted in Eastern. Bookmark the permalink.